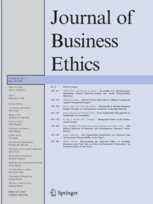 We’ve already reported on the retraction of a paper in a business ethics journal for plagiarism. Yes, plagiarism in an ethics journal. But it turns out there’s at least one more case of exactly the same thing, albeit in a different business ethics journal. The Editors and publisher regret to report that the paper published by Eugene Z. Geh as ‘‘The ‘Strong’ versus ‘weak’ premise of stakeholder legitimacy and the rhetorical perspective of diffusion’’ in the Journal of Business Ethics Online First, 25 March 2012, DOI 10.1007/s10551-012-1281-y includes several passages (about 16%) that duplicated passages published earlier by Sandy Edward Green as ‘‘A rhetorical theory of diffusion’’ in the Academy of Management Review (2004), 29(4):653–669. This is a violation of publication ethics which according to the Springer Policy on Publishing Integrity warrants a retraction of the article and a notice to this effect to be published in the journal. There was an extensive investigation done and all the evidence pointed to an isolated incident that was a mistake rather than a calculated effort to plagiarize. Based on the results of that investigation, JBE opted to provide the lightest form of action at their disposal and we opted to take no additional action beyond extensive internal conversations. Wicks was Geh’s professor for Foundations of Business Ethics, a course in which Geh earned a grade of Distinguished Performance. Speaking of available punishments, Mohammad Asif Salam earned a five-year publishing ban for duplicating his own work in the same journal. Score 9/10 for chutzpah. However the only 10/10 score in this department remains with the group of surgeons who extensively plagiarized in a seventy page article titled “Ethical Issues in Surgical Treatment and Research” (Current Problems Surgery 40: 348, 2003), which caused the entire journal issue to be retracted in 2007. Geh is an illustration for the flaws in current system where carrier is built solely on the number of publications regardless of number and/or severity of misconduct committed. Plagiarize, falsify, fabricate — anything is justified in order to get published. Then, who cares — the system is built solely on trust and critiques are not welcomed. In this case — Well done for Springer who Did_the_Right_Thing. Regrettably, in most cases the only thing the editors/publishers/institutions/COPE do is to cover up the misconduct, no matter what. IT’S TIME FOR A CHANGE OF THE SYSTEM!!! “Alliances date back to the beginning of the world as we know it, with early collaborations between Greek city states form to defeat Persia (Smith,Carroll, and Ashford, 1995). However, present day research interest in business alliances or cooperative relationships is largely rooted in the late 1970s and early 1980s when joint ventures were studied as vehicles for U.S. multinationals to expand internationally. During the last three decades, there has been a tremendous surge in alliance research, with studies examining topics as diverse as investment patterns, organizational governance choices, network structures, trust formation, and so on. Alvarez et al. (2005) commented that research into cooperative relationships has become a cottage industry of sorts as there have been many special issues devoted to alliances in the leading journals, and the topic has been represented at many management and strategy conferences. Given the extensive research into cooperative relationships despite the relatively short history of this stream of research, I believe that entrepreneurship is one of the most important and interesting frontiers for research on the alliance phenomena. Alliances date to the beginning of the world as we know it, with early collaborations between Greek city states formed to defeat Persia (Smith et al., 1995). However, present day academic interest in business alliances is largely rooted in the late 1970s and early 1980s when joint ventures were studied as vehicles for U.S. multinationals to expand internationally. Alliances were often equity joint ventures geared to respond to foreign governments’ restrictions on foreign direct investment. Typically the foreign investor sought local market access, technology transfer was unilateral, and collaborations tended to take place in commodity and other, less advanced industries. Today, however, alliances often involve complex deal structures, bilateral knowledge flows, and the blending of cooperation and competition amongst rivals (Reuer, 2004). During the last three decades, there has been an impressive rise in alliance research, with studies examining topics as diverse as investment patterns, organizational governance choices, network structures, trust formation, and so forth. There have been many special issues devoted to alliances in the leading journals, and alliances often represent a major share of presentations at management and strategy conferences. Alliance research has arguably become a cottage industry of sorts, and many alliance phenomena have been studied extensively despite the relatively short history of this stream of research. Given these developments in practice and theory, we believe that entrepreneurship is one of the most important and interesting frontiers for research on alliance phenomena. Most of the prior research on strategic alliances examines these relationships from the perspective of established, large firms. However, alliances can also be critically important to entrepreneurial firms (Alvarez and Barney, 2001; Ireland et al., 2006). Today’s competitive environment finds entrepreneurial firms increasingly using strategic alliances to accomplish many objectives, ranging from obtaining cost efficiencies to exploring new options in distant markets to obtaining resources such as financial capital or legitimacy from other firms. Brilliant detective work! I wonder if anything will come of it? If plagiarism is a Distinguished Performance, how does one merely Perform? Ironically Dean A. Shepherd, Editor-in-Chief, Journal of Business Venturing is on his dissertation committee (Source: http://www.darden.virginia.edu/web/uploadedFiles/Darden/PhD/Geh_CV_Jan_2013.pdf). Eugene Geh has plagiarised work from this very journal (see above). Will Dean A. Shepherd ignore that fact that the student has plagiarised work from his journal? At other Universities the student would have been expelled. At the level of PhD studies students should be aware of what plagiarism is and it appears that Eugene Geh has plagiarised repeatedly. Geh is just using the current system which is fundamentally flawed — it creates incentives for multiple misconduct while at the same time does nothing to deter offenders and/or rectify the situation. In most cases all what editors/publishers/institutions (and even COPE) do is COVER UP. They should be held accountable for not Doing_the_Right_Thing when evidence is presented. Does anyone see a problem with these two articles (also about “responsible business”)? John L. Campbell, 2007, “Why Would Corporations Behave in Socially Responsible Ways? An Institutional Theory of Corporate Social Responsibility,” Academy of Management Review, 2007, 32(3), 946–967. John L. Campbell, 2006, “Institutional Analysis and the Paradox of Corporate Social Responsibility,” American Behavioral Scientist, 49: 925. Can you state the problem you found? There are numerous identical passages in the two articles. Neither is cited in the other. Thanks, Retraction Watch, for covering this! Consistent to prior research, entrepreneurial orientation is deﬁned as the combined level of a ﬁrm’s innovativeness, pro-activeness, and risk-taking (Miller, 1983; Lumpkin and Dess, 1996). Here, we argue that a ﬁrm’s entrepreneurial orientation will affect its plans for engaging in international strategic alliances. More speciﬁcally, we posit that ﬁrms that are higher in entrepreneurial orientation have a higher propensity to engage in international cooperative behavior to seek growth. First, the notion of entrepreneurial orientation suggests that some ﬁrms are more willing than others to continually search for opportunities and solutions outside the realm of their existing activities (McDougall, Shane, and Oviatt, 1994; Lumpkin and Dess, 1996). Decisions with regard to entering into international strategic alliances entail a high level of uncertainty as ﬁrms enter into physically and culturally distant markets and have to work with a totally new alliance partner (Calof and Viviers, 1995). Since ﬁrms high in entrepreneurial orientation are willing to undertake risky decisions, they may be readily willing to engage in international strategic alliances. Secondly, we argue that all else being equal, ﬁrms that are high in entrepreneurial orientation are better able to make use of additional opportunities available from foreign countries and therefore will be more willing to act upon such opportunities. For instance, alluding to the pro-activeness dimension of entrepreneurial orientation, a pro-active entrepreneurial ﬁrm would exhibit a propensity to undertake a continuous search for opportunities (especially opportunities that do not pertain to the ﬁrm’s current activities) by monitoring environmental changes in a variety of countries on a frequent basis, even if it has not undertaken any formal business transactions in those countries as yet or does not to intend to in the short term (Lumpkin and Dess, 1996). Hence, it would be logical that when environmental changes beneﬁcial to the entrepreneurial ﬁrm’s potential activities in those countries do arise (for instance, legal restrictions of foreign direct investments become more relaxed), the ﬁrm may be conﬁdent that it can leverage the knowledge gain from its prior screening activities and decide to enter into an international cooperative relationship. Consistent with prior research, we define entrepreneurial orientation as the combined level of a firm’s innovation, proactiveness, and risk-seeking (Miller, 1983; Lumpkin and Dess, 1996). We argue that a firm’s entrepreneurial orientation will affect plans for extending internationalization. More specifically, we posit that firms that are higher in entrepreneurial orientation have a higher propensity to expand their cross-border activities in terms of the scope of their foreign markets or the intensity of activities within a foreign market. First, in contrast to the behavioral view of internationalization, the notion of entrepreneurial orientation suggests that some firms are more willing than others to continually search for opportunities and solutions outside the realm of their current activities (McDougall et al., 1994; Lumpkin and Dess, 1996). Decisions with regard to international expansion imply a high level of uncertainty as the firms enter physically or culturally distant markets or become more dependent on revenues generated in markets different from the more familiar domestic market (Calof and Viviers, 1995). Since firms high in entrepreneurial orientation are willing to undertake risky decisions (Miller, 1983; Lumpkin and Dess, 1996), they may more readily accept the uncertainty embedded in further increasing cross-border activity. Furthermore, we argue that the perceived uncertainty in foreign markets may be overcome by exchanging information with organizations who are more familiar with the specific local context (Acs et al., 1997; Zaheer and Mosakowski, 1997). Therefore, when a firm proactively seeks for additional foreign suppliers, customers, and alliance partners (e.g., existing multinationals) in a given country, a firm may overcome the uncertainty that arises when increasing the intensity of its activities in that market. Second, we argue that, all else being equal, firms high in entrepreneurial orientation are a in better position to take advantage of additional foreign opportunities, and therefore will be more willing to act upon such opportunities. For instance, the notion of proactiveness reflects the firm’s propensity to undertake a continuous search for opportunities, especially opportunities that do not pertain to the firm’s current activities. Therefore, a proactive firm may monitor environ- mental changes in a variety of countries on a frequent basis, even if it has not undertaken any formal business transactions in those countries yet or does not intend to do so in the short term (Lumpkin and Dess, 1996). However, when environmental changes beneficial to a firm’s (increased) activities in those countries do arise (for example, the legal restrictions on foreign direct investment become much more flexible), such a firm may be confident that it can leverage the knowledge gained from its prior screening activities and, therefore, decide to expand its cross-border activities.